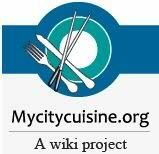 MyCityCuisine is a wiki project that aims to provide travelers with information about the must try dishes for the particular cities they are visiting. They are looking for contributors to add information about their city’s great dishes. It sounds like a fun project, and a pretty useful one. While most guidebooks will discuss the particular cuisine of a country, and even a major city, chances are that unless the city you are visiting is really well known for a particular thing, you’ll never know about it. This way you can find out what you definitely should not leave without trying. I’ve been trying to think what the must-eat dish in San Leandro is and I haven’t had much luck. We’re the sausage capital of California, or something of the sort, but there isn’t really any local place where you can go and eat sausage. Any thoughts?